I'm currently on my first paid vacation since 2010. God bless a full time job with paid time off! And, of course, I needed to bring a bag full of nail polish with me so I could change my nails every day. Today's mani of choice? Essie The Girls Are Out, one of the colors from the new Summer 2013 collection. 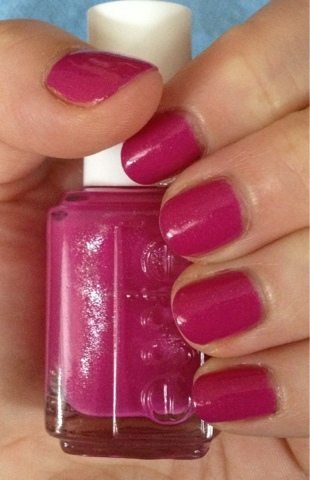 I originally used this color in a pedicure, and while it was pretty, I couldn't really see the shimmer in the formula. Once it was on my tips, though? Tons of silver shimmer and sparkle peeked through the bold fuchsia shade! This polish is definitely both a stunner and a keeper. What's on your nails right now? Let me know in the comments! Essie The Girls Are Out retails for $8 at essie.com.